Combat rules took a while to decide. Literally, it’s what I thought about for the past few weeks when I woke up at night. Opposed checks a-la FIGHTMORE, where who wins deals damage to the opponent. Trying to beat someone’s armour. Instead, I decided that every round you have ONE action. You can Attack (make a melee check to deal damage) and if you’re hit and have not used your action you can use it to Defend (make a melee check or save to counter an attack). There are small other adjustments but that’s it. How much damage? 1d6 + 1/3 of the margin or so. Much respect for Moldvay. Armour? Reduces damage, from 1 to 3. Shields give +3 to defend/save. Body modifier to damage? It already impacts on the hit roll, and the hitroll margin carries to damage. By the way, here’s how I’m going to present monsters in the handbook (not in the adventures, where they will have a slightly different treatment). There’s this thing in fantasy that is essentially needed, and that’s the supernatural. Things must happen that defy mundanity and verge into the supernatural. Fantasy needs magic, and there’s a school of thought that if there’s magic, it’s fantasy (and that would put Star Wars in “fantasy” because of Jedi Juju). Said that, you might now that who’s writing is a big fan of magic systems. So when I started writing W20 I deliberately ignored the thorny question of how to write magic. The Voice – you can spend a round and one mana to subtly change the tone of your voice and give an order to a person. If you win a contest of Voice (Soul) over the victim Save (Soul) they will carry our the order for up to 1 turn. Giving a directly self-harming order or orders going against the core beliefs of the victim requires an Awesome success or otherwise the victim will instead be confused and take no action for 2d6 rounds. And I could also use AFG’s Traditional Magic (named this way because of its traditions). Casters could spend mana for casting spells. And Wonder & Wickedness’s Sorcery. Casters would spend mana for memorizing spells. And Vancian Rotes. Barkerian Lore. Words of power. Rune Magic. Psionics. Alchemy. Shapechanging. Maenads. Or I could use them all. All their different mechanics. At the same time. Disciplines are ways of doing magic. There would be different disciplines, and casters would get one at character creation, plus one every few level (probably instead of a stat increase). Traditional Magic would be a discipline, Vancian Rotes would be another, the Seven Sorcery Schools would be 7, the Voice would be one, and so on. They are not necessarily compatible: while the Traditional spells can be cast through Vancian Rotes, the Voice gives no talent in Alchemy, but they all burn mana, and mana is mana. And mana comes from within, and from other places too. And is going to be a horrible pain to design properly in a non terribly messed up way. Wish me good luck, Freddie. Paolo, weren’t you going to keep this clean and simple? Yes. The baseline mode would be Traditional Magic. It’s really really simple. But if someone wants to play something simpler, they can just pick up Voice or some other simple, self-contained discipline. They can all be tucked away in a separate book and never mentioned again. 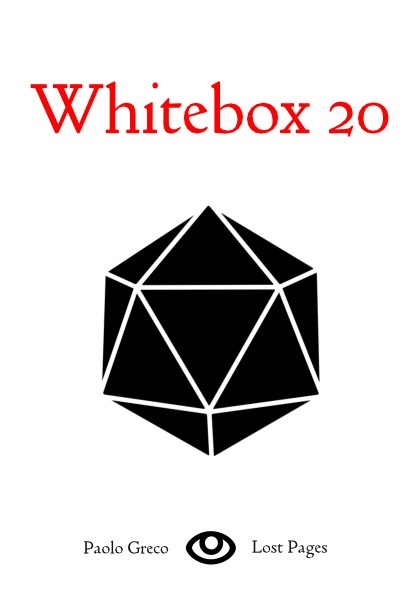 I’ve been toying here with design decisions for Whitebox and I felt I was hitting a good stride. 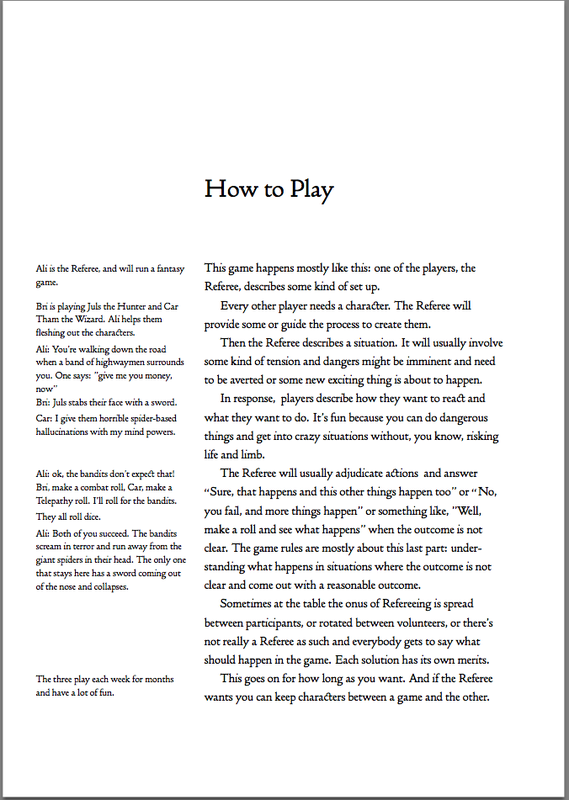 And I have a document where I’m actually writing the game, which is great. It’s not great because HELL YEAH PROGRESS, it’s great because that’s the point where you’re actually, you know, finalizing the decisions. It forces the designer to take a choice. Yeah, they’re not final. I can go back and change the rules. But as the game gets written (not played, as it’s totally possible and recommended to try different rules during exploratory playtest), it takes a shape, and the taking shape means that you have to choose its shape. And I didn’t feel comfortable with the shape. I felt some of the good decisions I was taking were not bringing the game where I wanted. I want a pick up and play barebone adventure game with clean mechanics. I was designing a skill-based adventure game with clean mechanics. I curbed down, wrote some, and will playtest soon. Ok, we are still in inner-head-rable-land here. Part of a series. Feel free to skip this instalment. By next time I should actually have a small document ready. Typeset in LATEX. The current margin system needs a margin of 5 for a full success, 10 for great and so on. This is good in case of success because we immediately know by looking at the die the margin: if we pass and it’s a 5, the margin is 5, marginal. Just look at the d20. The dice shows 6? margin is 6, full success. Just look at the d20. 11? margin is 11, great. Just look at the d20. Interestingly, if you have a -3 to the roll, it just changes the maximum success. If you have strength 12 and roll 6, it’s a full success. Just look at the d20. Strength 12 and -5 to the roll? 6 is still a full success. Just look at the d20. -8 to the roll? 6 is a failure, no need to know the margin. This also means that if you’re not good you simply don’t have the option for incredible successes. This is intended. Except if you risk. This is intended too. Do you have an Alternity? There’s another way that could work. Alternity came with a margin system that I think is great BUT requires some math. Roll under the modified attribute for a success, but IIRC if you roll under attribute/2 it’s a full success, under attribute/4 for critical. You might have had to roll and sum/subtract extra dice as difficulty modifier. Neat. Very neat. I was really impressed back then (and sadly didn’t play Alternity). But requires mathsing. Ok, it’s math that is easy and somewhat can be done in advance, but it’d rather it not be there, and I’m not sure this math is actually easier than calculating the margin. who knows? Yet another alternative, is to have full successes on every even number, criticals on every number divisible by 4. This allows anybody (with an attribute of 4 or more) to have marginal, full and critical successes, but it’s a bit faffy. Also I don’t really like the idea that someone with an attribute at 4 can succeed as well as someone with the attribute at 27. Yet another way is to roll multiple times. This combines nicely with bennies and dice pools, and let’s disregard momentarily that rolling a number of times depending on a high-spread attribute is potentially unwieldy (you train a little, 1 reroll, but if you train a whole lot, 5 rerolls? would would this work with improvement-through-usage?). D&D 5E does this (also AFG and Chthonic Codex before it) but it has the unfortunate issue of being more effective for attributes toward the middle of the spread, when the base success rate is around 50%. Training for people with little or a lot of talent is ineffective. This is not something I want in my game. A variation is to roll multiple times and count successes. I really liked this in Merchant & Marauders, which uses this approach with something like the 5MORE system. While still having problems with low attribute, at least high attributes get multiple successes. Which by definition win over a smaller number of successes. I have to run the math for this, but I suspect it can be handled as a variant of the original WoD system (without the horrible critical special cases that made that system a horrible moraine where sometimes being better at something meant both more chances of failure, both normal and critical). Oh it’s just me showing what a bit of what went through my head while designing W20. Oh, right, yes, I was there when we decided this. Let’s start with: what kind of resolution mechanic do you want? Possibly based on a d20. Stat in the 3d6 range, roll under stat to succeed, because stats are often underused in those games. Also, roll-under but high is good for contests because if you succeed the margin of success is whatever your die shows. That’s good. And of course from 1 to 5 becomes a marginal success, 6-10 a success, 11-15 a great success (or double success), 16-20 phenomenal (triple), over 20 extraordinary (quadruple). Also, it’s a system you can “lean on”: if in doubt, just ask for a roll, and a “yes/no/how good” result will come out, no need for contests or establishing difficulties beforehand. That means that that if my strength is 5 I can’t do more than a marginal success at, say, brawling. How is that good? Yes, it’s intended. It makes stats somewhat more important. You can still get more than a marginal success if you play dirty, say bring a lightsabre to a fistfight. how do you get a margin of over 20 if the stats are rolled with 3d6? You can risk. You can basically say “ok, I risk X”, so if you roll from 1 to X on the d20, you fail. But if you pass, that’s great, because you get a +X to the success. If you have strength 5 and want to risk 3, you now fail on anything over 5 AND on 3 or less, but if you succeed (with a 4 or 5 in this case) you would get a +3 to the success, bringing the success to 7 or 8. We playtested risk in a very long campaign and it was amazeballs. “IT WORKS ON THE TABLE” SHALL BE MY ULTIMATE METRIC. And for people with say intelligence 37? If whatever you have to roll under is over 20, add the difference to the margin. Your supersmartpants would get +17 to the margin. If you’re tricking Coyote, prepare to lose hard. So for checks you have roll under stats, and for combat you have… roll under what? Probably roll under descending armour, so we can use this thing. So if the target armour is 3, you need to roll 3 or less. Which makes it a bit annoying, because it means that good melee modifiers are negative: if you have a to-hit bonus of 3, and you roll a 4, you hit armour 1. Which is ok, but conterintuitive. And modifier are pants and I want to get away from them as much as possible. Alternatives? I want solutions, not problems. An alternative is to give multiple attacks instead of attack bonuses, but it’s unexplored territory. Or have the attack roll under combat, and defence rolls a defence roll, which could be used also for blocking/dodging maybe. Or have the attack roll under combat, and have the armour reduce damage. And maybe you get a free block attempt. Didn’t you say something about “working at the table”? Ok, I need to playtest. What about skills and other things? Well, you can roll under the related stat. And if you’re untrained, under half stat. And if you’re trained, under stat + 4 or whatever. Don’t you have a system that proved itself at the table like that you could plug in? Oh, yeah. I could work something like 5MORE in. Let me do some math. 5MORE requires on average 3*3*6 = 54 tests to get +1 on a d6 (+17%) on a task. Which is a lot of padlocks or climb walls or enchanting or downtime practice. That means that using the same progression to get a +4 on a d20 (+20%) you’d need 54/17%*20% = 64 rolls or so. That turns out to be a +4 modifier spread over 64 rolls, which is 1 in 16 rolls. 1 in 16 is unfortunate. 1 in 20 is slower but better because we can have an automatic skill improvement on a natural 1. Which is when you succeed by your teeth. Seems good. Roll a 1, barely succeed and get a +1 on the relevant skill forever. Isn’t 1 in 20 a bit too low? Maybe the +1 can be gained also on a 20? is 1 in 10 ok? Playtesting is needed. What about untrained improvement through use? If you do this while untrained, you just pile up some +1 to compensate that you’re rolling under stat/2. And when you get enough +1s to counter the stat/2 penalty, you’ve done enough to be trained. And you can get +1 training pips when you practice and someone teaches you, until you roll against stat+4. Doesn’t that mean that a less gifted, lower-statted PC will be trained before someone that is more gifted? Yes, but it’s irrelevant because they also will be worse than some. This means that if you are less gifted, you benefit from training up to a certain point, but more gifted people will benefit from more training. Being untrained does not give penalties but training give you bonuses instead, and the more gifted you are the more training you can get. So, why can’t you get training in Melee and Missile instead of leveling up as a fighter? Can you? I think it really depends on the kind of game you want to design. Maybe you can. We’ll see.